Last year was a big one for Tom Cruise. While he has been starring in films since the early 1980s, the one title that he released last year, Mission: Impossible - Ghost Protocol, actually wound up being the biggest hit of his career, raking in nearly $700 million globally. Because of that astounding success, it's no surprise that his next movie, which also happens to be coming from the same studio (Paramount Pictures), is trying out a similar marketing strategy to the action box office hit. Yahoo! UK has gotten their hands on the first UK one-sheet for Jack Reacher and if you're wondering why it looks familiar it's because it's almost exactly the same as this one for Ghost Protocol. You can see the new poster below or in high-res over at the source. 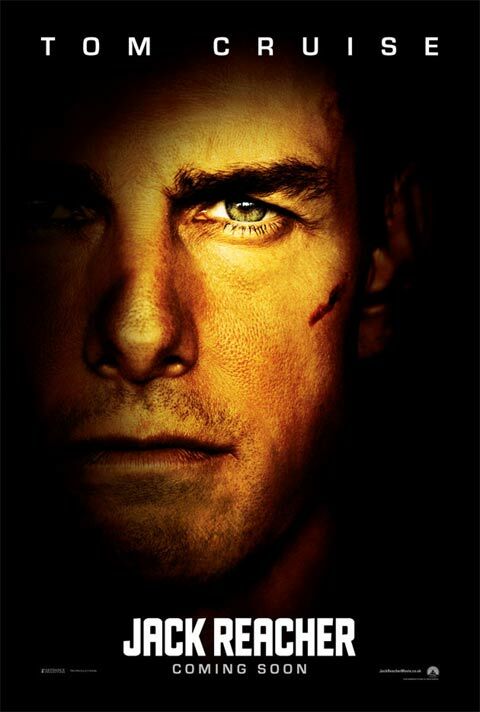 Based on the book "One Shot" by Lee Child, the film stars Tom Curise as the titular character, an ex-military investigator who is called in when a military sniper is accused of murdering five people in cold blood. The film is written and directed by Christopher McQuarrie (The Usual Suspects, The Way of the Gun) and co-stars Rosamund Pike, Richard Jenkins, Robert Duvall, Jai Courtney, Werner Herzog and Michael Raymond-James. I had the chance to see the first ever footage from Jack Reacher a couple months ago and you can read my reaction to the footage HERE. It will be in theaters on December 21st and you can see more from the movie, including the first trailer, in our Blend Film Database.